Vanessa and Ray Jackson systematically starved their four adopted sons, beat them with brooms, rulers, sticks, shoes, and belt buckles, and choked them. 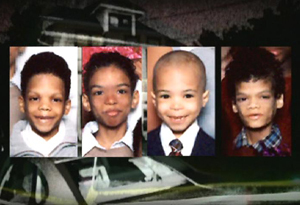 When they were found, Bruce, 19, weighed 45 pounds; Keith, 14, weighed 41 pounds; Tyrone, 10, weighed 28 pounds; and Michael, 9, weighed 23 pounds. Vanessa kept the kitchen locked up and the boys were so hungry they sometimes gnawed on wood paneling. Several other adopted and foster children were not mistreated. The abuse came to light when a neighbor saw the oldest Jackson boy, severely malnourished, rummaging in garbage cans. The couple homeschooled all of the children and lived in New Jersey. Vanessa plead guilty and Ray died before conviction.